Oooh, that's beautiful! Nature really is the best artist ever, right? What would a non-wordless Wednesday say about these pictures? There's something slow and creaky about the first, and something kind of sad and pathetoic about teh second. Don't you agree? Wow! These are so very cool! You have an amazing eye to see things that most people wouldn't! What a good eye you have. I wonder what caused the pattern in the top picture? I've never seen anything like it. My husband took down this tree last week. 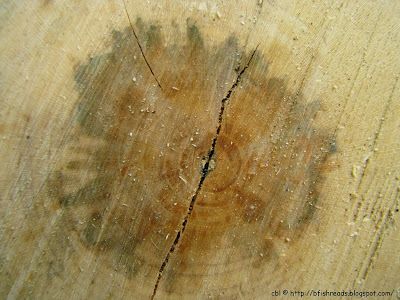 He was laughing at me for taking photographs, asking: Why would anyone want to see shots of diseased wood? I took almost 50 photos. I love the patterns. It's like one of those Rorschach tests. In the first one I see a mushroom, or when viewed large, I see a man carrying something very heavy over his shoulders. I agree they are cool patterns. very interesting, I love seeing all the details in the wood. 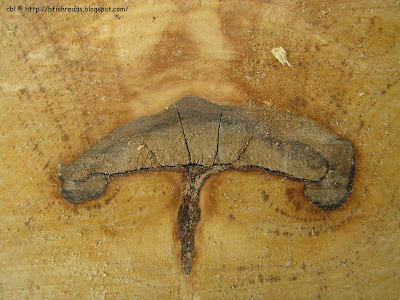 I think it gave the tree trunk character..too bad it was cut down. Great patterns and swirling. What a shame that you only see it after the tree is cut down. Thanks for your comment on my blog - it would be great if you publicized this link. I think it's going to be a really fun one! Summer Stock Sunday is starting soon - come check it out! I see a mushroom in the top one and water stain in the bottom. Fun photots! Not 'just' wood, but obviously freshly cut. The sawdust on the second shot just makes it. Very nice. Sometimes the beauty is in the details. You always take the most interesting photos. I really like the top one. The imperfection(?) really stands out. I had to puzzle out what if was for a second or two. Thanks for coming by. To other readers: you definitely want to click for the larger versions to get the full effect. These are really interesting colorings and formations. Interesting photos and perfect for Wordless Wednesday! Beautiful. I love wordless wednesdays! Can't wait to say hello at BEA...I want to hear about Guernsey! So lovely! I think I can smell that wood! Such unusual photos. Thanks for a fascinating look at wood.